Discover the quiet estuaries, charming villages, gorgeous beaches and World Heritage wilderness of the Tweed region, on the far NSW North Coast. The main town is Tweed Heads, where you’ll find fishing charters, river cruises, houseboats and barbecue boats for hire, and underwater tours. Cooly Dive will take you snorkelling or diving in the Cook Island Aquatic Reserve, a haven for green sea turtles, giant gropers and myriad ocean life. Watersports Guru in Kingscliff, a short drive south of Tweed Heads, offers snorkelling tours to the marine sanctuary, too. 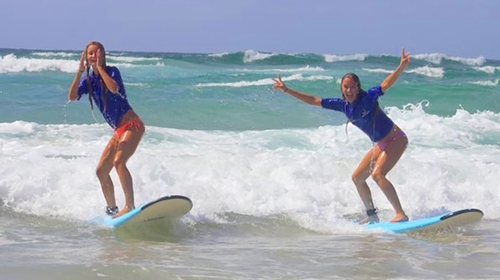 Kingscliff is blessed with great beaches and world-class surf breaks. Excellent cafés and restaurants are along Marine Parade and Bells Boulevard, such as the award-winning Fins Restaurant. A short drive inland is Tropical Fruit World, a popular attraction for lovers of orchards and fresh fruit. Part of the Tweed region is in a caldera, a crater of a huge extinct volcano now carpeted with a vivid green tapestry of farms and rainforest. The Minjungbal Aboriginal Culture Centre will give you insights into the region’s Aboriginal cultural heritage. You can savour fresh seasonal produce from the rich volcanic soils in cafes and restaurants and at Tweed Foodie Festival and Foodie Friday Food Trail. Murwillumbah, 35 minutes’ drive inland from Tweed Heads, is home to the Tweed Regional Art Gallery and the World Heritage Rainforest Centre, which documents the region’s wildlife and botanicals. Both Murwillumbah and the nearby village of Uki are on the banks of the beautiful Tweed River and near Mount Warning in World Heritage-listed Wollumbin National Park. Accommodation options in the Tweed region suit a range of budgets. Check out the events calendar for festivals such as the Tyalgum Festival of Classical Music and the Tweed Valley Country Roots Festival. Gold Coast Airport is less than 10 minutes’ drive from Tweed Heads.